Most music fans of a certain age probably had their favourite ‘Walkman albums’, those cassettes that worked perfectly on headphones, revealing intricacies (weird panning effects, funky little motifs, stereo drum kits) rarely noticed when played on normal speakers. As much as I had loved Joni Mitchell‘s music ever since my dad played me ‘Chinese Cafe (Unchained Melody)’ in 1983, I’d never have predicted that Dog Eat Dog would turn into one of my top headphone albums. A clue, of course, was the presence of Thomas Dolby as co-producer and keyboard player, master of quirky soundscapes and synth textures. 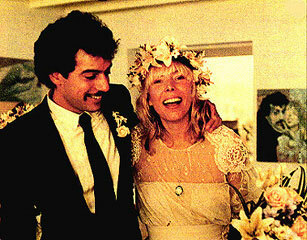 Though initially he might seem a weird choice of collaborator, with hindsight it’s not that much of a surprise that Joni and co-producer/bassist/hubbie Larry Klein should enlist his services. Joni admitted in contemporary interviews that she ‘could use a hit’ and Dolby was still pretty hot in early ’85. But, according to Karen O’Brien’s biography ‘Shadows And Light’, they didn’t get along particularly well in the studio, Dolby not enamouring himself to her by blithely calling her ‘Joan’ between takes. One of the key aspects of Dog Eat Dog is Joni’s palpable anger, both lyrically and vocally. Her cover pose says it all – throwing her hands up in the air with indignation and/or helplessness. As she puts it, the album is a portrait of ‘a culture in decline’. She takes aim at TV evangelists, consumerism, lawyers, yuppies and Reaganites with equal candour, letting fly with an F-bomb on the superb ‘Tax Free‘ which also features some spirited spoken-word work from Rod Steiger. The album also features some of Joni’s strongest singing on record. Her melodies are sometimes resplendent too, particularly on the title track and ‘Lucky Girl’. It’s also interesting to hear her trying out a slightly more minimalist lyric-writing approach on ‘Fiction’ and ‘Tax Free’, marrying her short, sharp lines to Klein’s music. ‘Good Friends’, initially a brooding piano ballad in demo form, kicks the album off in fine style, an AOR classic with more interesting chord changes than the usual and a typically distinctive guest spot from Michael McDonald. It was a bold though unsuccessful attempt at a hit, far too good for the charts. Joni even sung it live on ‘Wogan’ with a McDonald impersonator! The elegant, stately ‘Impossible Dreamer’ is described by Joni as ‘a tribute to Martin Luther King, John Lennon, and Robert Kennedy – all those who gave us hope and were killed for it.’ It also features some sparkling soprano sax from Wayne Shorter. Master drummer Vinnie Colaiuta is mainly reduced to providing drum samples for Dolby, though plays some lovely stuff on ‘Shiny Toys’, the second single from the album and subject to a great 12″ mix by Francis Kevorkian. A lot of people would probably have liked her to carry on making Blue for the rest of the ’70s and ’80s, but she was moving on. Every album was different and this may be the one most in need of critical reassessment. Some tracks would definitely benefit from acoustic reinvention, but hey… It’s Joni.